Create event-driven code in Zoho CRM, without being constricted by web servers or integration platforms. 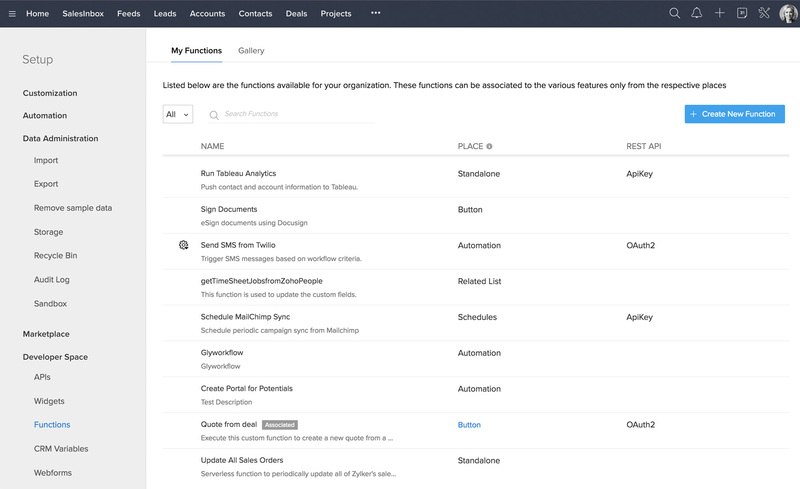 Functions in Zoho CRM, open exciting new avenues for developers who want to create code that works with Zoho CRM's APIs, app components, and workflows. Zoho CRM handles all server infrastructure necessary to host and run your code, so that your team can focus on applying their development skills into deploying more features. Add your functions to Zoho CRM. Create functions that work independently, or work with your Zoho CRM data and workflows. 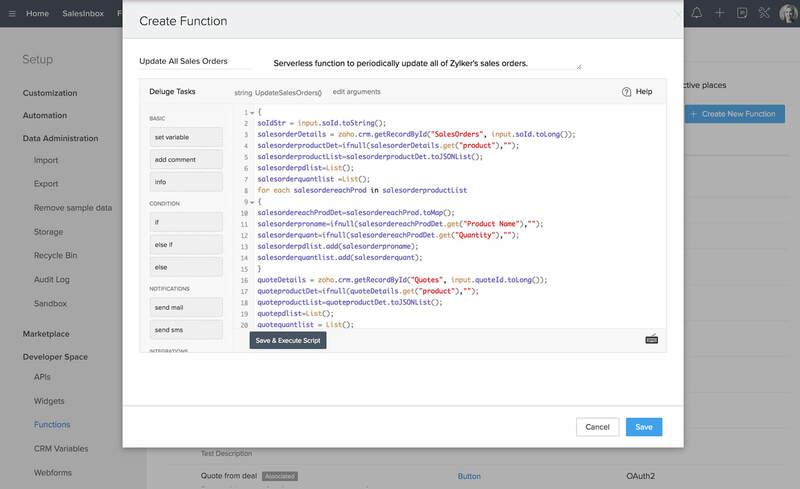 Your code can be used to trigger or respond to Zoho CRM events, or work with REST API from any application. Use webhooks without web servers. Webhooks generally require web servers, which come with their own share of issues that slow down development. Functions allow you to use webhooks to respond to any XML or HTTP-based request, without ever needing a web server. Invoke your function through a REST API from any environment. Instantly create REST APIs with both OAuth2 and API Key authorization for any of your functions. Zoho's own scripting language—Deluge—allows you to add advanced logic to your code, without having to write thousands of lines. Deluge's drag and drop style of adding tasks lets you add powerful features to any Zoho CRM account with just a few lines of script.